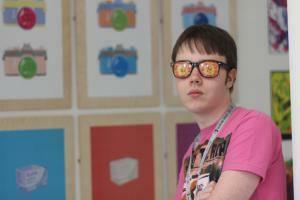 Former de Stafford School pupil Jake had his work featured at the OXO Tower Wharf in London, as part of the eighth annual Origins Creative Arts Festival. Now on Art & Design Level 2, Jake was delighted to see his work displayed amongst work from his peers at East Surrey College and around 200+ worldwide institutions with UAL Awarding Body qualifications. The festival hosted a selection of works from across various disciplines, which included work from Levels 1-3 at East Surrey College, as well as the Level 4 Foundation Diploma. Jake’s piece was selected as one of 12 ‘outstanding’ pieces of work, and he was awarded with a £50 Amazon token at the event! His masterpiece, a pop art piece, titled ‘Smile’, "focusses on the camera as object," and was a digital print on 3mm birch plywood.